MTACon.com » Exercise And Video Games? Sign Us Up! If you’ve got some disposable income, though, and are jonesing for sports action on a lousy winter day, play any of the following games. We spent hours testing our video-game prowess and determined that these are the five most exciting and physically challenging machines around. If you can find them all in one place, try our basic videogame circuit workout. Hint: Play with intensity. The more aggressive you are, the more real the games feel. Sega’s freewheeling Top Skater, the current king of sports video games, simulates skateboarders’ aggressive creativity with great detail and authenticity. Each of the game’s two courses offers numerous skating options: Get huge air off ramps, half pipes or Coca-Cola billboards. Or go for max speed. Or grind your axle on hand rails and tree pots. You compete only against the clock and yourself. Where’s the burn? Your calves and quads. Game controls: A twin-tail skateboard that functions a bit like a snowboard. Designers anchored the front end so you need to swing the back end to turn sharp. Otherwise, steer it like a skateboard, leaning slightly for small direction changes, kicking the tail for big jumps or tapping the front end for an ollie. Safety rails in front of you and on the sides help you get and stay balanced. How it plays: Though overuse has made the skateboards on some machines a bit squirrelly, most handle well and feel true to street riding. Bold graphics, a nonstop music soundtrack by skater fave Pennywise and perfectly recreated skateboard tricks like the 720 McTwist boost the game’s authenticity. Rating the thrills: High. I get a dizzying rush each time I pull off an S-grade jump (achieve this elite trick by launching an air maneuver at the last possible second). Both the novice and expert courses also have multiple individual thrill spots. Novice highlight: the freestyle platform in the middle of the course. Expert highlight: the eerie full-pipe. How does Sega’s downhill skiing simulator rank? Double black diamond all the way. The steeps seem dose to vertical, the jumps are huge and the races – you can ski either downhill or slalom – are super-competitive. Watch out for opponents who try to force you into the trees. Where’s the burn? Your quads. Game controls: Connected side-by-side ski “steps” that are angled toward the video screen, forcing you into a tuck. The steps rotate left and right on a central axis, which allows you to edge your skis sharply in either direction. You can also shift the entire control rig more than a foot in each direction to carve big, sweeping turns. Two stationary poles help you maintain balance. How it plays: Since the skis are short and connected in the tight, parallel position effortlessly employed solely by expert skiers (but not novices or erratic intermediates like me), it took a few games to master the controls. 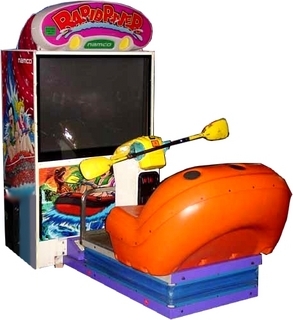 Also, the machine doesn’t bounce you around on bumps, though controlling your speed and direction becomes harder. Rating the thrills: Medium to high. Trees, competing skiers and blinding whiteouts come at you so fast that the entire screen sometimes seems like a blurry kaleidoscope. If you’re able to pick out a clear path through the mess, though, jumps are abundant and the hang time feels real. This game, made by Namco, simulates the basic aspects of its sport better than any of its revolutionary brethren. Each of this mountain-biking game’s two race courses, a speed hill and a technical run, includes flat spots, jumps and other challenging terrain. And with scores of other racers – both computer-controlled competitors and human opponents – whizzing down the course, it’ll piss you off just like that crowded popular trail back home does. Game controls: A stationary, single-geared mountain bike with shock-absorbing powers. To steer: Turn the handlebars or lean left or right – the bike shifts more than a foot in each direction, so you can lay it out hard on turns. If you have to use the brakes, the levers are on the handlebars. How it plays: The logo-covered bike is light and comfortable, and it handles differently depending on the terrain. Around easy turns, it’s nice and grippy. On the bumps, it’s less responsive and a little jiggly. On the fiats, where you’ve got to pedal all-out or your bike will stop cold, it’s stable and smooth. Only on tight turns does the bike’s responsiveness feel sluggish. That, or maybe all 14 crashes were the result of my pathetic high-speed riding skills. Rating the thrills: Medium. Though soaring jumps and violent spills abound, the small video screens and weak sound system don’t broadcast the virtual thrills as well as some of the other games do. Sega’s personal-watercraft simulator drops you into a race course with nine other jet-set boaters. Water conditions vary, the competition’s tough, and jumps are plentiful. Dolphins get involved, too. Game controls: A replica of a Yamaha Wave Runner personal watercraft. To steer: Shift your weight left or right, turn the handlebars or do both. The boat leans about a foot to each side. Accelerate by squeezing the throttle above the right-hand grip. How it plays: If you spray some water on your face and crank up a leaf blower to simulate the triple-digit decibels created by most personal watercraft, you’ll swear you’re really ripping. Like a real PWC, the replica Yamaha bounces rhythmically on the straights and cuts efficiently on the turns, unless you take one too tight, in which case the tail skips and whips across the water. The craft jerks and shudders in choppy water, too, forcing you to hang on tighter and concentrate a little more. Rating the thrills: High. Hit a jump or a wave at full speed and feel your stomach bottom out. As with Top Skater, speeding to the finish line is only one of many game options on this whitewater-rafting simulator. You can perform a little whitewater rodeo in the rapids or play around in the giant whirlpool until your rotator cuffs feel like they’re going to rip apart. Where’s the burn? Triceps, biceps and your cardiovascular system. Game controls: A single metal paddle that’s situated parallel to the ground at shoulder level. Sit in the roomy seat and move the oars rhythmically in clockwise circles to paddle; the quicker you spin, the faster your raft goes. To turn, stop paddling and dip an oar left or right. One person can control the paddle at both ends, or two players can work side-by-side as a team. How it plays: The paddle turns smoothly and responds to commands quickly and, as it should, the game rewards a strong, rhythmic rowing motion, I felt the closest to real whitewater rafting, though, when we smacked the raft against the rocky shoreline. The pneumatic machinery provides ample bounce, and that really forces you to concentrate in order to keep the desired paddling rhythm. One drawback: The virtual [H.sub.2]O provides minimal resistance. Rating the thrills: Medium to high. Though the game fails to recreate the soaring adrenaline surges of a real whitewater excursion, the bouncing raft and some unexpected obstacles – whirlpools, ice patches, powerful raft-flipping geysers – will quicken your pulse and churn your stomach. What are you waiting for?